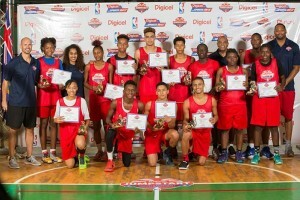 Four players from host BVI heard their names called among the final 13 of the 63 players from nine Caribbean countries attending three intense days of the Digicel NBA Elite Camp at the Multipurpose Sports Complex that ended on Sunday. Four from Bermuda also advanced to an NBA authentic experience in New York, December 6-11. Among the five girls, Shaliquah Fahie and Mahkayla Pickering of the BVI will be joined by the Barbados duo of Tower Lorde and Ivanna Odle as well as Bermuda’s Ish-Nae Smith. The eight boys are Demoi Bradley and Omar Walker of the BVI; St. Croix born Remey Brewer of Trinidad and Tobago; Antigua and Barbuda’s Anthony Greer; Bermuda’s trio of Kobie Reid, Colin Peters and Jarel Smith and Turks and Caicos Islands’ Wilkins Sylvain. Justice said the selection was based on what the players did over the three days of the camp and how they performed whether they were selected or not. Justice said unlike in the clinics the players went through in their respective countries last month, they put in a camp offense and five set plays used NBA players. He added that a lot of NBA teams are using the sets to get into things. Justice said it was an excellent camp. The ethics of the kids was great, the effort they brought—diving on the floor for loose balls—and they played really hard.